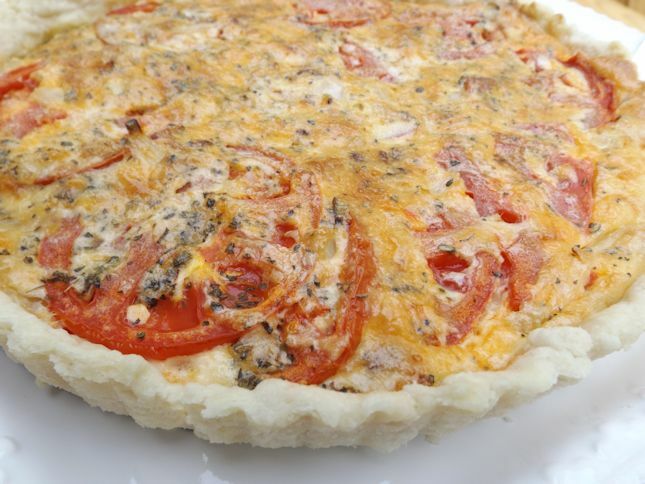 Savory Tomato Tart| Savory Tomato Tart is bursting with summertime flavor. Savory Tomato Tart is the definition of summer. When I can go out and pull a tomato off the vine and turn it into this delicious tart, I know my summer is in full swing. I have too much shade at my house to grow full-sun plants but I do manage to eke out a little space on my deck for a couple of tomato plants. Typically, I utter a few eeks when I find those giant tomato worms on my plants or nosy squirrels rooting around the vines. 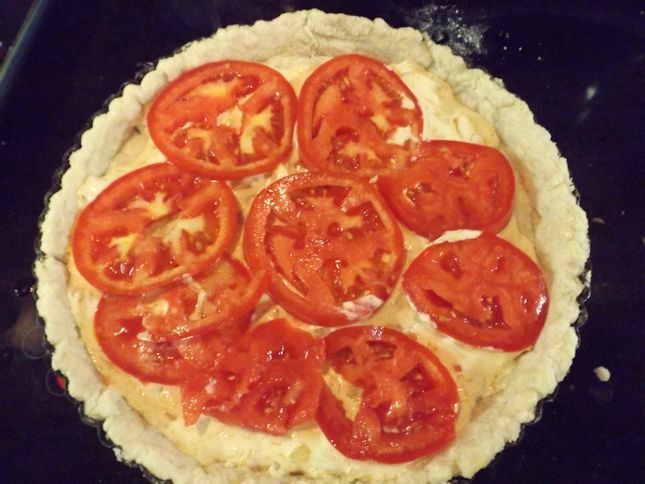 However, it is all worth the effort when I get to make my Savory Tomato Tart with home-grown tomatoes. I love versatile recipes and this one fits the bill. You can make it in a pie pan or a tart pan or even individual pie pans. You can choose your favorite cheese to add to it and obviously choose your favorite tomato variety. I like Better Boy and also heirloom black tomatoes the best. 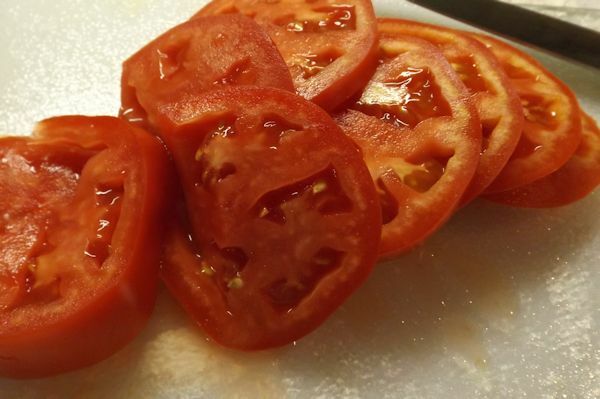 Just find some juicy ones so your Savory Tomato Tart will be full of flavor. My tastes have certainly changed since I was younger. One place I read said that we crave more sweet foods when we are younger to help provide the boundless energy we burn off. As we get older we prefer more savory dishes. Interesting theory. I’m just glad that I eat tomatoes now because I really enjoy them in many different ways. I will leave you with a little tomato food history. The earliest tomatoes come from Peru where even today, wild varieties of tomatoes still grow. Early American colonists wouldn’t eat tomatoes due to their resemblance to the deadly nightshade plant. Finally, much later, Thomas Jefferson started growing tomatoes and including them in his cooking. By 1824 everyone was growing tomatoes and eating them. Thank you , T.J. I think you would have liked my Savory Tomato Tart. 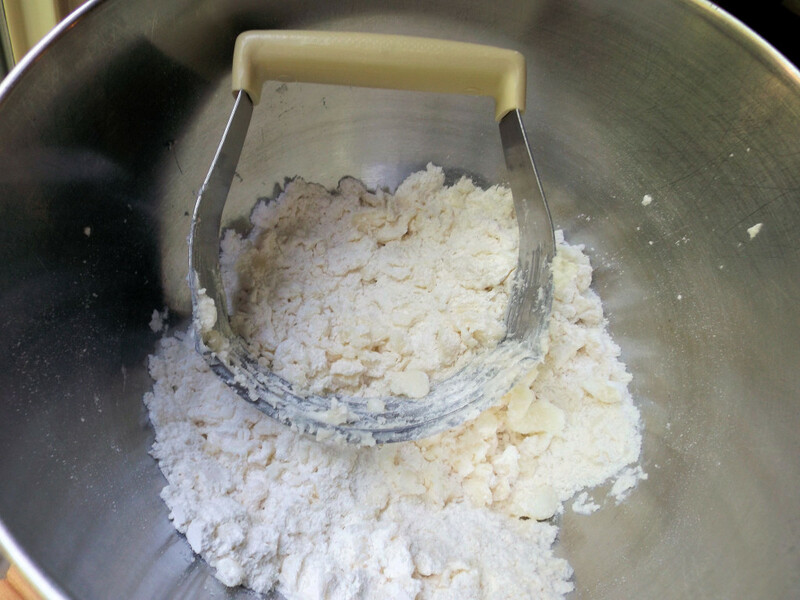 To make the tart shell: Stir the salt into the flour. 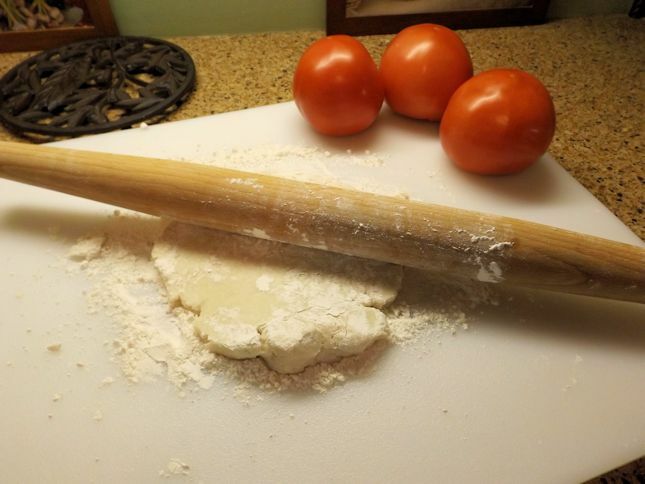 Use a pastry blade to cut the shortening into the flour and salt. The mixture should be the size of peas. Add the water a tablespoon at a time using a fork to blend. The dough should form a loose ball. Roll out on a floured surface. 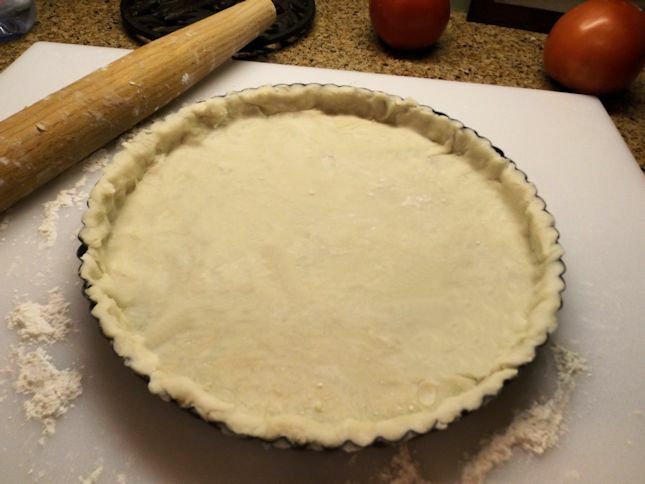 To make the filling: Place pie crust in a tart pan and brush with milk. (You could also use a pie pan if you don’t have a tart pan.) Bake at 450 degrees for 5 minutes. Remove from oven and allow to cool slightly. 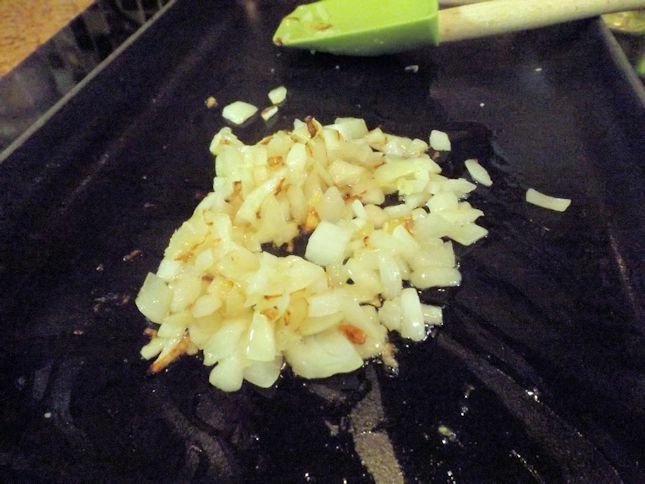 In a small skillet, cook the onion and garlic in the olive oil until soft. 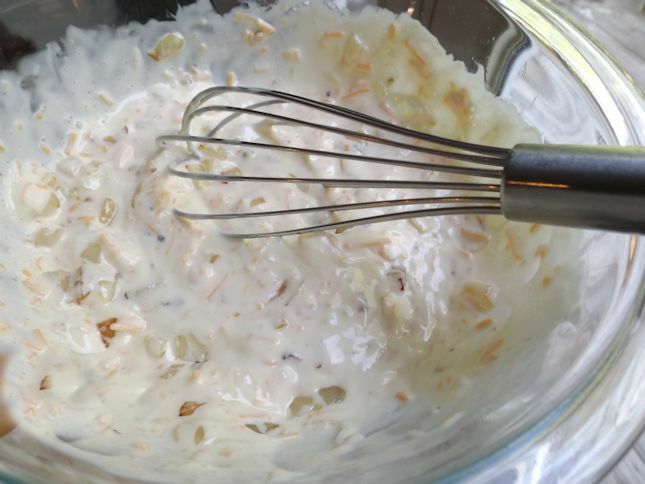 In a small bowl, mix the mayonnaise, half and half, and egg with a wire whisk. Add the basil and cheese. Stir in the onions and garlic. Add salt and pepper to taste. Place half of the mayonnaise mixture in the tart pan. Place the tomatoes in the pan so that they completely cover the bottom. Place the rest of the mayonnaise mixture on top. Bake at 350 degrees for 35-40 minutes.